Animated GIF hub Giphy has certainly been having its share of fun with this week's GOP Convention speakers, but one of its tweets has taken on a life of its own. 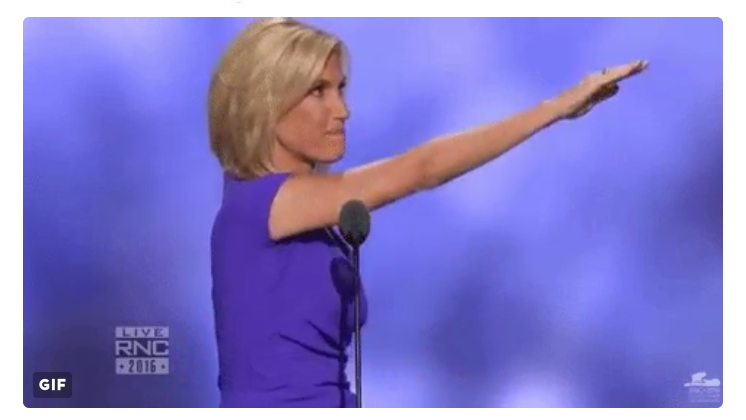 While many of the anti-Trump crowd on Twitter mocked conservative commentator Laura Ingraham's awkward on-stage wave for its fleeting similarity to a Nazi salute, Giphy put in the extra work and turned the moment into a perfectly isolated and endlessly looping GIF. Most of Giphy's tweets from the night scored a modest handful of likes and retweets, but this one exploded. As I write this, it has more than 3,500 retweets and 2,000 likes, and the number is likely to grow as more people hear about the moment. Impressively, this success comes despite Giphy not actually saying the phrase "Nazi salute." With the simple intro "Did she just…", the tech brand gives itself enough wiggle room to avoid seeming overly antagonistic.